Winshuttle Foundation™ allows companies to automate complex SAP-based business processes across the organization using workflow applications that include web-form or Excel-based capabilities. Automated workflows mean you have full visibility and trackability into data collection and approvals that could otherwise get lost in someone’s email. Simplify and optimize your SAP-centric processes. Maximize the return on your existing investment in SAP. Control, administer and leverage centralized scripts for SAP updates. Striking a balance between allowing the flexibility needed by the business and meeting the governance requirements of IT, Foundation enables enterprise-wide deployment of the Winshuttle platform. Foundation enables server-side execution of SAP upload and download scripts created with both web forms and Winshuttle Studio desktop tools. Foundation is a SharePoint-based solution that automates business processes via web forms and workflows while natively integrating with SAP. Foundation allows you to validate and improve data before it is entered into SAP. The workflow capabilities within Foundation enable customer approvals and routing activity that provide visibility and traceability directly from Excel or web forms. Foundation also provides rapid solution development to streamline data collection and validation, reduce cycle times, and increase data quality demands. What infrastructure is needed to start using Foundation? 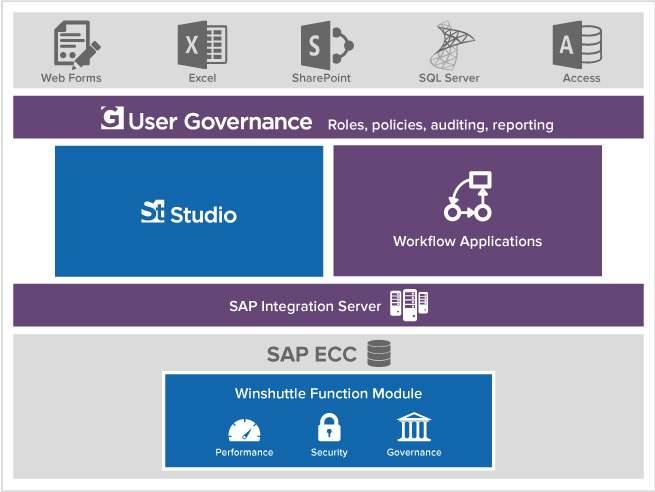 The User Governance module of Foundation can be deployed in a new or existing SharePoint environment. The minimum requirement is Windows SharePoint Services, which is the basic version of SharePoint available for Windows Server. Do I still need Studio? Yes, you will still need Studio to create custom scripts to load or extract SAP data. What are the different kinds of dashboards available in Foundation? Foundation offers a series of out-of-the-box dashboards across our User Governance, Studio Execution, and Forms and workflow solutions. There are a number of dashboard reports that can be used to help you manage your licenses, review workflow interactions and system performance, and empower data team managers to improve your allocation of resources. Why would I need workflow applications? Workflow applications provide you with the ability to build solutions that collect data in an organized manner, transform it, and perform checks and approvals before posting data to SAP. This can be done not only by using web forms that interact with workflow apps from the browser, but also with Excel workflow that allows you to set-up a spreadsheet for those who want to create data. This provides users with the ability to accept, reject and reassign workflow tasks all from the comfort of the familiar Microsoft Excel ribbon. How long does it take to develop a workflow application? The time to develop an application depends on the size & complexity of the solution. These solutions can take between a few days to a few months to develop, based on the skill level & understanding of the resource used to develop the solutions. What skills are required to build a workflow application? The Foundation platform provides a robust set of capabilities to develop new solutions for data entry, maintenance and correction with out-of-the-box functionality that a typical business power user could use to create basic applications. For more advanced applications that grow beyond basic functionality, Winshuttle provides Java Scripting capabilities that may require programming skills.